The point from which distances from London are calculated. This article is about a location in London. For other uses, see Charing Cross (disambiguation). Charing Cross roundabout, with a Statue of Charles I on the site of the original Eleanor Cross, once a three-way junction. 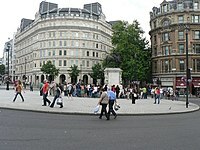 Charing Cross (/ˌtʃærɪŋ ˈkrɒs/) is a junction in London, England, where six routes meet. Clockwise from north these are: the east side of Trafalgar Square leading to St Martin's Place and then Charing Cross Road; the Strand; Northumberland Avenue; Whitehall; The Mall leading to Admiralty Arch and Buckingham Palace; and two short roads leading to Pall Mall. It makes an unbroken public space with Trafalgar Square in central London. A bronze equestrian statue of Charles I by French sculptor Hubert Le Sueur has stood there since 1675. The junction takes its name from the medieval Eleanor cross that stood on the site from the 1290s until its destruction on the orders of Parliament in 1647. It gives its name in turn to the immediate locality, and to landmarks including Charing Cross railway station, on the forecourt of which stands the ornate Queen Eleanor Memorial Cross of 1864–1865. This was once the heart of the Westminster hamlet or neighbourhood of Charing. Until 1931, "Charing Cross" also referred to the part of Whitehall between Great Scotland Yard and Trafalgar Square. Drummonds Bank, on the corner with The Mall, retains the address 49 Charing Cross (not to be confused with Charing Cross Road). Since the early 19th century, Charing Cross has been the notional "centre of London" and the point from which distances from London are calculated. The name of the area, Charing, is derived from the Old English word "cierring", referring to a bend in the River Thames. The addition of the name "Cross" to the hamlet's name originates from the Eleanor cross erected in 1291–94 by King Edward I as a memorial to his wife, Eleanor of Castile, and placed between the former hamlet of Charing and the entrance to the Royal Mews of the Palace of Whitehall (today the top of Whitehall on the south side of Trafalgar Square). Folk etymology suggests the name derives from chère reine – "dear queen" in French – but the original name pre-dates Eleanor's death by at least a hundred years. This wooden sculpted cross was the work of the medieval sculptor, Alexander of Abingdon. It was destroyed in 1647 on the orders of the purely Parliamentarian phase of the Long Parliament or Oliver Cromwell himself in the Civil War. A 70 ft (21 m)-high stone sculpture in front of Charing Cross railway station is a copy of the original cross. Erected in 1865, it is situated a few hundred yards to the north-east of the original cross, on the Strand. It was designed by the architect E. M. Barry and carved by Thomas Earp of Lambeth out of Portland stone, Mansfield stone (a fine sandstone) and Aberdeen granite. It is not a faithful replica, being more ornate than the original. A variation on the name appears to be "Charyngcrouche", near St Martin in the Fields, in 1396. Since 1675 the site of the cross has been occupied by a statue of King Charles I mounted on a horse. The site is recognised by modern convention as the centre of London for the purpose of indicating distances by road in favour of other measurement points (such as St Paul's Cathedral which remains as the root of the English and Welsh part of the Great Britain road numbering scheme). 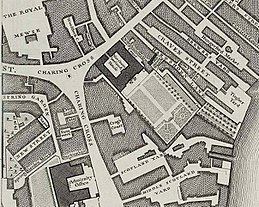 Charing Cross is marked on modern maps as a road junction, and was previously a postal address denoting the stretch of road between Great Scotland Yard and Trafalgar Square. Since 1 January 1931 this section of road has been designated part of the Whitehall thoroughfare. The cross has given its name to a railway station, a tube station, police station, hospital, a hotel, a theatre, and a music hall (which lay beneath the arches of the railway station). Charing Cross Road the main route from the north (which becomes the east side of Trafalgar Square) was named after the railway station, which was a major destination for traffic, rather than for the original cross. An extract from John Rocque's Map of London, 1746, showing Northumberland House. The two projecting garden wings had not yet been added. At some time between 1232 and 1236, the Chapel and Hospital of St Mary Rounceval was founded at Charing. It occupied land at the corner of the modern Whitehall and into the centre of Northumberland Avenue, running down to a wharf by the river. It was an Augustinian house, tied to a mother house at Roncesvalles in the Pyrenees. The house and lands were seized for the king in 1379, under a statute "for the forfeiture of the lands of schismatic aliens". Protracted legal action returned some rights to the prior, but in 1414, Henry V suppressed the 'alien' houses. The priory fell into a long decline due to lack of money and arguments regarding the collection of tithes with the parish church of St Martin-in-the-Fields. In 1541, religious artefacts were removed to St Margaret's, and the chapel was adapted as a private house and its almshouse were sequestered to the Royal Palace. In 1608–09, the Earl of Northampton built Northumberland House on the eastern portion of the property. In June 1874, the whole of the duke's property at Charing Cross, was purchased by the Metropolitan Board of Works for the formation of Northumberland Avenue. The frontage of the Rounceval property caused the narrowing at the end of the Whitehall entry to Charing Cross, and formed the section of Whitehall formerly known as Charing Cross, until road widening in the 1930s caused the rebuilding of the south side of the street, creating the current wide thoroughfare. In 1554, Charing Cross was the site of the final battle of Wyatt's Rebellion. This was an attempt by Thomas Wyatt and others to overthrow Queen Mary I of England, soon after her accession to the throne and replace her with Lady Jane Grey. Wyatt's army had come from Kent, and with London Bridge barred to them, had crossed the river by what was then the next bridge upstream, at Hampton Court. Their circuitous route brought them down St Martin's Lane to Whitehall. The palace was defended by 1000 men under Sir John Gage at Charing Cross; they retreated within Whitehall after firing their shot, causing consternation within, thinking the force had changed sides. The rebels – themselves fearful of artillery on the higher ground around St James's – did not press their attack and marched onto Ludgate, where they were met by the Tower Garrison and surrendered. So firmly in the city. At the Restoration eight of the regicides were executed here, including the notable Fifth Monarchist, Colonel Thomas Harrison. A statue of Charles I was later erected on the site. This statue had been made in 1633 by Hubert Le Sueur, in the reign of Charles I, but in 1649 was ordered to be destroyed by Parliament. Subsequently, after being hidden by the man charged with destroying the statue, it resurfaced at the Restoration, and was erected here in 1675. 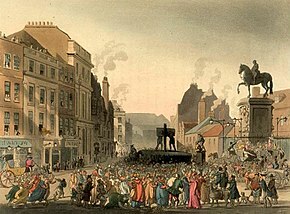 A prominent pillory, where malefactors were publicly flogged, was situated next to the statue of King Charles. To the south of Charing Cross was the Hungerford Market, established at the end of the 16th century; and to the north was the King's Mews, a royal stable. The area around the pillory was a popular place of street entertainment. Samuel Pepys records in his diaries visiting the surrounding taverns and watching the entertainments and executions that were held there. This whole area was transformed when Trafalgar Square was built on the site in 1832. "Heads, heads – take care of your heads", cried the loquacious stranger as they came out under the low archway which in those days formed the entrance to the coachyard. "Terrible place – dangerous work – other day – five children – mother – tall lady, eating sandwiches – forgot the arch – crash – knock – children look round – mother's head off – sandwich in her hand – no mouth to put it in – head of family off"
The story was based on an incident of 11 April 1800, when the Chatham and Rochester coach was emerging from the gateway of the Golden Cross: "a young woman, sitting on the top, threw her head back, to prevent her striking against the beam; but there being so much luggage on the roof of the coach as to hinder her laying herself sufficiently back, it caught her face, and tore the flesh in a dreadful manner"
The inn was demolished for the creation of Trafalgar Square and a new Golden Cross Hotel was built in the 1830s on the triangular site now fronted by South Africa House. Though this hotel is now also gone, the memory is preserved in commercial offices facing the Strand named Golden Cross House. 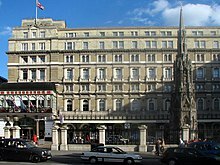 The railway station opened in 1864, fronted on the Strand with the Charing Cross Hotel. In 1865, a replacement cross was commissioned from E. M. Barry by the South Eastern Railway as the centrepiece of the station forecourt. It is not a replica, being of an ornate Victorian Gothic design based on George Gilbert Scott's Oxford Martyrs' Memorial (1838). The Cross rises 70 feet (21 m) in three main stages on an octagonal plan, surmounted by a spire and cross. The shields in the panels of the first stage are copied from the Eleanor Crosses and bear the arms of England, Castile, Leon and Ponthieu; above the 2nd parapet are eight statues of Queen Eleanor. The Cross was designated a Grade II* monument on 5 February 1970. The month before, the bronze equestrian statue of Charles, on a pedestal of carved Portland stone, was given Grade I listed protection. Fragments of the medieval original remain in the Museum of London. By the late 18th century, the Charing Cross district was increasingly coming to be perceived as the "centre" of the metropolis (supplanting the traditional heartland of the City to the east). 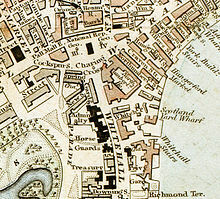 From the early 19th century, legislation applicable only to the London metropolis used Charing Cross as a central point to define its geographical scope. 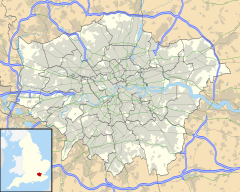 Its later use in legislation waned in favour of providing a schedule of local government areas and became mostly obsolete with the creation of Greater London in 1965. 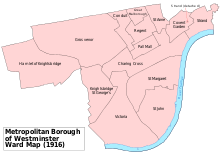 Metropolitan Police District The Metropolitan Police Act 1829 made provision that all parishes within 12 miles of Charing Cross could be added. This was expanded to 15 miles by the Metropolitan Police Act 1839. Metropolitan Buildings Office The London Building Act 1844 allowed that any place within 12 miles of Charing Cross could be added to the area of responsibility. Hackney carriage licensing and The Knowledge The London Hackney Carriage Act 1831 and subsequent legislation set the radius within which cab drivers were obliged to take a fare. Streets within a six-mile radius of Charing Cross are still included in taxi driver training. Street Trading The Metropolitan Streets Act 1856 gave the Commissioner of Metropolitan Police the power to control various activities within a six-mile radius of Charing Cross. Powers to license shoeblack pitches are still in force but in practice are superseded by individual London boroughs' street trading arrangements. Road distances from London continue to be measured from Charing Cross. Prior to its selection as a commonly agreed central datum point, various points were used for this purpose. John Ogilby's Britannia of 1675, of which editions and derivations continued to be published throughout the 18th century, used the "Standard" (a former conduit head) in Cornhill; while John Cary's New Itinerary of 1798 used the General Post Office in Lombard Street. The milestones on the principal turnpike roads were generally measured from the terminus of the individual road, mostly on the perimeter of the metropolitan area: these points included Hyde Park Corner, Whitechapel Church, the southern end of London Bridge, the southern end of Westminster Bridge, Shoreditch Church, Tyburn Turnpike, Holborn Bars, St Giles's Pound, Hicks Hall (the terminus of the Great North Road), and the Stones' End in The Borough. Some roads into Surrey and Sussex were measured from St Mary-le-Bow church. Some of these structures had been moved or destroyed, but their former locations continued to be used for distances. The result was that "all the Books of Roads ... published, differ in the Situation of Mile Stones, and instead of being a Guide to the Traveller, serve only to confound him". William Camden speculated in 1586 that Roman roads in Britain had been measured from London Stone, a claim that was subsequently widely repeated, but that is unsupported by archaeological or other evidence. The front entrance of Charing Cross railway station in a 19th-century print. The cross in front of the station Hotel is a Victorian replacement for the original Eleanor Cross which stood near the site. To the east of the Charing Cross road junction is Charing Cross railway station, situated on the Strand. On the other side of the river, connected by the pedestrian Golden Jubilee Bridges, are Waterloo East station and Waterloo station. The nearest London Underground stations are Charing Cross and Embankment. ^ "Charing Cross" entry in Collins English Dictionary. ^ Chisholm, Hugh, ed. (1911). "Charing Cross" . Encyclopædia Britannica. 5 (11th ed.). Cambridge University Press. pp. 859–860. ^ "The Eleanor Crosses". Eleanor of Castille. Museum of London. Retrieved 12 November 2013. ^ A print drawn by Augustus Pugin and Thomas Rowlandson for Rudolph Ackermann's Microcosm of London (1808–11). ^ Pepys Diary – frequent visits between 1660–69. Particularly 13 October 1660 – for his account of the execution of Harrison. ^ Historic England. "Details from image database (427795)". Images of England. Retrieved 13 February 2009. ^ Historic England. "Details from image database (209087)". Images of England. Retrieved 13 February 2009. ^ Barrell, John (2006). The Spirit of Despotism: invasions of privacy in the 1790s. Oxford: Oxford University Press. pp. 20–27, 34. ISBN 978-0-19-928120-6. ^ Ogilby, John (1675). "Preface". Britannia. London. ^ Cary, John (1798). "Advertisement". Cary's New Itinerary. London. ^ Paterson, Daniel. A New and Accurate Description of all the Direct and Principal Cross Roads in Great Britain (12th ed.). London. p. x. ^ a b Answers and Returns Made Pursuant to an Act: Passed in the Eleventh Year of the Reign of His Majesty King George IV. Intituled "An Act for Taking an Account of the Population of Great Britain, and of the Increase Or Diminution Thereof". January 1833. p. 498. ^ Hissey, James J. (1910). The Charm of the Road. London: Macmillan. p. 58. OCLC 5071681. ^ Historic England. "Bow Bell Milestone 35 miles from London (1252622)". National Heritage List for England. Retrieved 9 July 2015. ^ The Traveller's Pocket-Book: or, Ogilby and Morgan's Book of the Roads Improved and Amended, in a method never before attempted. London. 1760. p. iv. ^ Clark, John (2007). "Jack Cade at London Stone" (PDF). Transactions of London and Middlesex Archaeological Society. 58: 169–89 (178). 'The statue of Charles I and site of the Charing Cross', Survey of London: volume 16: St Martin-in-the-Fields I: Charing Cross (1935), pp. 258–268. URL: http://www.british-history.ac.uk/report.aspx?compid=68141 Date accessed: 6 March 2014.